As the largest excavator in our range, the EX8000-6 is capable of exceptional levels of productivity. Twin Cummins diesel engines provide the power and maximum operating efficiency comes from our computer-aided Engine-Pump Control. The flow speed can be increased, in between unloading and excavating, to further enhance efficiency. Fitted with a 40m3 loading shovel or 43m3 backhoe bucket, the EX8000-6 takes three passes to load a Hitachi EH4000ACII dump truck. It can also be used with our largest dump truck, the EH5000AC-3, which it takes four to five passes to load. 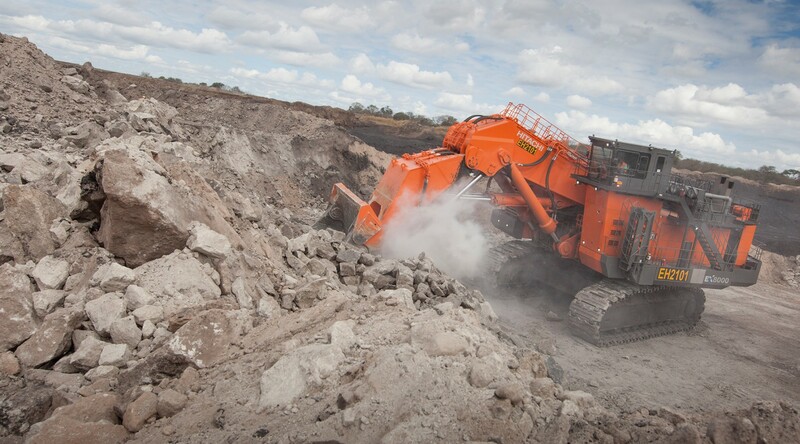 Durability and reliability are part of the DNA of our large excavators. The design of the EX8000-6 incorporates a durable rigid box design and solid cast track frame, as well as robust lower rollers, track links and drive tumblers. It also includes several easy maintenance features to ensure it can keep working reliably 24/7, particularly in remote locations. Many components are convenient to access thanks to a large central service area and folding stairs with wide steps. Replacement of parts, including bucket teeth and shrouds, is also straightforward to minimise maintenance time.